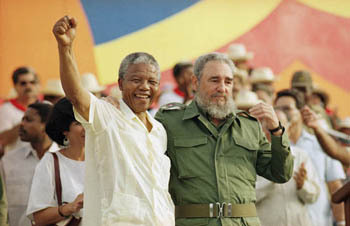 Mandela and Castro on the Moncada Barracks to celebrate the Attack on the Moncada Barracks, 26 July 1991. The revolution in Cuba, culminating in Fidel Castro’s seizure of power on 1 January 1959, was from the beginning based on a non-racial ethos, and revolutionary Cuba was an early opponent of apartheid and racial segregation. It is no surprise to read Castro’s many pronouncements against racism, which he considered one of the central challenges of the new society the Communist Party sought to create. What is nevertheless surprising is the massive effort that Cuba – with its finite resources further limited by the United States (US) economic blockade – expended in support of African liberation struggles. Cuba supported the armed struggles of liberation movements of South Africa, Cape Verde, Guinea-Bissau, Angola and Mozambique. Cuba’s support for South Africa’s liberation was of a different sort from that of other Anti-Apartheid Movements: it came not in the form of civil society activism, but as a state in alliance with provisional governments and independent states in the African continent. Cuba’s military engagement in Angola kept the apartheid state in check, foiling its geopolitical strategies and forcing it to concede defeat at Cuito Cuanavale, and ultimately forcing both PW Botha and FW de Klerk to the negotiating table. Already in the 1960s, Che Guevara provided support for the liberation movement in the Congo, and in the 1970s Cuba helped defend Agostinho Neto’s Movement for the Liberation of Angola (MPLA) against aggression by the US and its agents, Zaire and South Africa. This support continued until the 1980s, when the aggressors were forced to back down, leading to the liberation of the entire subcontinent. At the first Summit of Heads of State and Government of the Non-Aligned Summit in Belgrade in September 1961, Cuban President Osvaldo Dorticos Torrado denounced apartheid. Attending the United Nations (UN) Conference on Trade and Development in Geneva in 1961, Che Guevara, the minister of industry, said that South Africa ‘violates the Charter of the United Nations by the inhuman and fascist policy of apartheid’, and he called for South Africa’s expulsion from the UN. Speaking at the 19th General Assembly of the UN in New York in December 1964, Guevara pointed to the UN’s failure to act against apartheid. In 1960, Cuba began to receive students from the Republic of Guinea, Congo-Brazzaville and Mali, and in 1963 Cuba sent a team of medics to newly liberated Algeria. By 1999 more than 28,000 African students had graduated from educational institutions in Cuba, and more than 76,000 Cubans had served in Africa in some capacity or other. Perhaps Cuba’s most sustained support was for the Angolan MPLA when it was locked in a struggle against South African troops. This intervention was crucial for the entire subcontinent, whose peoples were held in subjection by an unholy alliance between a racist regime (South Africa), a superpower (the USA), and a corrupt dictator (Zaire’s Mobutu Sese Seko). South Africa, in fighting the MPLA, was willing to go to war because it saw in the MPLA the demise of apartheid rule in South Africa and Namibia. In fighting the South Africans, the Cubans were thus fighting for the liberation of Angolans, Namibians, and South Africans. Cuba’s war against South Africa and its allies (the National Front for the Liberation of Angola [FNLA] and National Uinion for the Total Independence of Angola [UNITA], supported by the USA and Zaire) occurred in a few stages. At first, Cuba came to the defence of the MPLA when the South Africans were trying to install Jonas Savimbi of UNITA and/or Roberto Holden of the FNLA as the leaders of Angola. Seeing Agostinho Neto’s MPLA as a communist movement that would alter the geopolitical balance in the region and help bring the downfall of the apartheid regime, the South Africans did all they could to displace the MPLA before independence was announced. When they failed in this objective (at battles at Quifangodo, Cabinda, Ebo and other sites) during 1976, they continued a campaign of destabilisation after independence. Despite several setbacks during the later 1970s and early 1980s, they began their most massive drive to oust the MPLA in 1987 when the two sides fought a colossal battle at Cuito Cuanvale. Following the overthrow of Marcellus Caetano in Portugal, the country’s colonies – Angola, Mozambique, Guinea-Bissau – were headed for independence. The decolonisation of Angola was formalised in the Alvor Agreement, which was agreed to by the MPLA, Jonas Savimbi’s UNITA, and Holden Roberto’s FNLA on 15 January 1975. A temporary government consisting of leaders from the three movements and Portugal was to be established by 31 January 1975. Elections were to be held before the official proclamation of independence on 11 November 1975 and the withdrawal of Portuguese troops would take place by the end of February 1976. By April a fragile ceasefire, organised by the Portuguese, was in place in Angola. The FNLA – supported by Zaire, Portugal and South Africa – controlled two provinces in the north. UNITA was operating in the central and southern regions, while the MPLA occupied 12 of the country’s 16 provinces by September, but had a precarious hold over these territories as FNLA and UNITA forces continued to try to take over as much territory as they could in order to secure political dominance by 11 November. 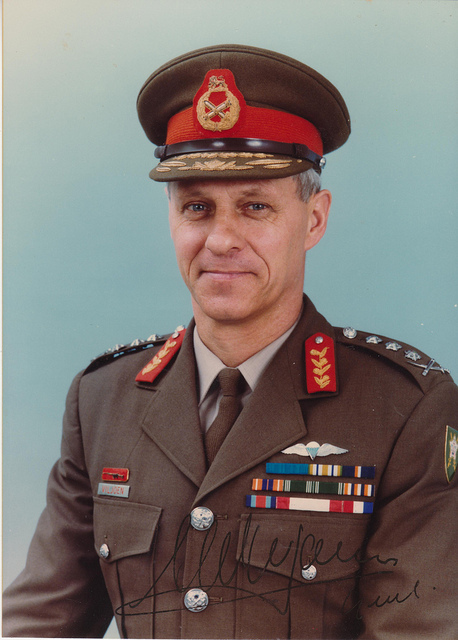 General Constand Viljoen who commanded South Africa forces in Angola. The FNLA and UNITA made several attempts to attain these objectives (see timeline for details). On 5 October 1975, UNITA troops led by South African advisors clashed with FAPLA (People’s Armed Forces for the Liberation of Angola) troops in Nova Lisboa, Savimbi’s capital. On 14 October the ‘Zulu column’ – a 4,000-strong force of Angolans, FNLA fighters, Portuguese mercenaries and South African troops – crossed over from Namibia into southern Angola, swiftly moving north. Deploying a scorched earth policy, they took over the towns of Pereira de Eca and Rocadas by 20 October. Called Operation Savannah, the plan was to destabilise the MPLA regions ahead of 11 November, when Angola would achieve independence. Another SADF unit, called Foxbat, flew to Silva Porta, Savimbi’s headquarters, bringing armoured vehicles and other materiel in late October. By 28 October they took the port of Mozamedes from Portuguese troops, who abandoned the port. On 2 and 3 November 1975, FAPLA and Cuban troops were confronted by the Zulu Column in Benguela, and tried to defend the town of Catangue. After fierce clashes, the Cubans and Angolans were forced out of Benguela and Lobito, leaving the Zulu Column determined to march to Luanda. On 23 October 1975 FNLA troops attacked Morro de Cal and pushed the MPLA and Cuban forces to Quifangodo. A major battle took place at Quifangodo, where 850 Armed Forces for the Liberation of Angola (FAPLA) troops, 200 Katangese and 88 Cubans faced an onslaught by the FNLA, Zairean mercenaries and South African Defence Force (SADF) troops. More than 345 FNLA troops were killed and more were wounded, and General Roos ordered a retreat of his artillerymen. On 28 November, they boarded a South African ship and sailed to Walvis Bay in Namibia. The clash in Quifangodo proved to be a major defeat for the FNLA, Ziarean, and South African bloc. A day before the announcement of independence on 10 November 1975, FNLA troops, together with Portuguese and Zairean troops, attacked FAPLA positions, unsuccessfully. By 6pm on 10 November, the Portuguese lowered their flag and announced that sovereignty had been transferred to the Angolan people, but neglected to say that the MPLA would be in government. The next day, Agostinho Neto announced the birth of the People’s Republic of Angola. The new state was not allowed to begin anew, as forces allied to South Africa continued to challenge the new regime. The oil-rich province of Cabinda, geographically separated from the Angolan mainland by a Zairean strip, was a major target for the anti-MPLA forces – the US, South Africa, Zaire, and their puppet, the Front for the Liberation of the Enclave of Cabinda (FLEC). The MPLA and their Cuban advisors were faced with conflicts on various fronts, but Cabinda was a territory that was of economic and strategic importance for the future of the country. Movements of FLEC and Zairean troops indicated that they were about to attack the enclave as independence loomed, and on 8 November the attack began. A thousand FAPLA troops and 232 Cubans defended Cabinda, and by 12 November they launched an offensive that sent the aggressors to Zaire in retreat. Led by a French mercenary, Bob Denard, FLEC lost the battle, as well as 1600 men. Meanwhile, the Zulu Column pushed forward from Catangue, Benguela and Lobito, headed to Luanda via Novo Redondo. The Cubans organised an ambush 24km south of Novo Redondo, and retreated to Novo Redondo itself to reinforce a defensive position. The ambush succeeded in slowing down the Zulu Column, but after heavy fighting they took Novo Redondo by 13 November. The Zulu Column was set to take Porto Amboim and then divide into two, with one column headed for Luanda and the other for Dondo, the source of Luanda’s power supply. However, the start of the rainy season slowed them down, and the Cuban/Angolan forces dug in on the northern bank of the River Queve, which stands between Novo Redondo and Porto Amboim. The Cuban/Angolan forces blew up bridges to stop the advance of the Zulu Column. Four bridges were destroyed, preventing the South Africans from advancing to Quibala, where 200 Cubans and 400 MPLA troops dug in to defend a 150km stretch. A series of battles took place from 8 November to mid-December in the Ebo area, but Cuban commander Arguelles used strategies to stop the South African advance. On 23 November, the SADF tried to cross a bridge from Ebo to Gabela, but came under fierce attack, losing 30 men, with twice as many being wounded. They retreated to Cela, heavily demoralised. However, other SADF units mounted attacks and took Morros de Tongo, and moving east they took Cariango, Gungo, and Tari. Eventually, however, by 18 December the southern front was secured by the Angolan/Cuban forces. On 16 December FAPLA forces addressed international media and presented four South African soldiers as proof that South Africa was engaged in a war within Angola, a fact that had been suppressed inside South Africa and was not acknowledged by international media and governments such as the US. The four South African soldiers were also presented at an Organisation of African Unity (OAU) summit, which announced that the OAU would grant official recognition to the People’s Republic of Angola. With the southern front stabilised, the Cuban/Angolan forces launched offensive attacks on South African positions, retaking several towns and villages and driving the South Africans further south. On 6 January 1976 Cela and Santa Combo were liberated. In other operations South African soldiers were killed and four more were captured. On 8 January 1976, Huamno fell to the Cuban/Angolan forces, depriving South Africa and UNITA of their stronghold. On 10 January, Lobito and Benguela fell, followed by Sa de Bandeira on 16 January and Mozamedes the next day. Many other towns fell to the Cuban/Angolan forces. On 4 February, South African Defence Minister PW Botha told the Washington Post that the SADF had withdrawn its 5,000 troops from Angola, although they would remain along the border in the south – from Zambia to the Atlantic – to safeguard the Cunene reservoir that supplied electricity to then-South West Africa (SWA). Cuban President Fidel Castro travelled to Guinea-Conakry to meet with President Agostinho Neto, Sekou Toure of Guinea and Luis Cabral of Guinea-Bissau. The four heads of state spoke at a rally on 15 March 1976, and Neto and Toure praised the Cubans for their crucial support for the Angolan struggle against the South African/US/Zairean aggressors. Castro vowed to destroy the Cunene dam and stop the electricity supply to SWA. Ten days later, on 25 March, Botha announced in Parliament that South Africa would pull out all its troops by 27 March because it had been guaranteed that the hydroelectric facilities in Cunene would not be attacked. Some 3,000 troops in 60 military vehicles withdrew from Ruacana, the site of the Cunene dam, blowing up the 900m Rocada bridge as they left. The Cuban/Angolans and South Africans met on 30 March and signed agreements to respect the borders. Nonetheless, the defeat proved to be just one chapter in a saga that would continue until the fall of apartheid. South Africa would continue to make attempts to destabilise the Angolan government’s rule. Despite their agreement to stop incursions into Angola, the South Africans continued to operate in the region, fighting against ANC and South West Africa’s People’s Organisation (SWAPO) forces based in the area. Yet, they did not confine themselves to these supposedly South African conflicts. On 4 May 1978, the SADF attacked a camp in Cassinga, 210km inside Angola, which gave refuge to more than 3,000 Namibian refugees. The elderly, women and children were massacred, among the dead 300 children. Cuban troops based 15km south of the town made their way to stem the attack, but they were hindered by land mines and attacks from the South African Air Force. Despite the obstacles, they managed to arrive in time to save many of the refugees from certain death. The attack convinced the Cubans that they had to remain in Angola, as it became evident that the South Africans were still intent on establishing strongholds for Savimbi’s UNITA, in the hope that they would establish a ‘provisional government’ and eventually defeat the MPLA. In August 1981 the South Africans, using a force of 15,000 troops, again moved into Cunene province, ostensibly to attack SWAPO bases. In June 1983, UNITA forces attacked Cangamba, a village which was home to Angolan and Cuban forces. By 2 August, 6,000 UNITA soldiers were poised to deliver a decisive blow, but they were stopped by heavy air bombardments, and by Cuban reinforcements that arrived on 11 August. Towards the end of 1983, the South Africans launched Operation Askari, and attacked Sumbe with 1,500 UNITA forces in tow. Nevertheless, their advance was halted by Cuban and Angolan fighters. In May 1985, a small South African unit engaged with FAPLA forces in Cabinda, but they were routed, and their leader, Captain Winan Petrus du Toit, was captured. During interrogation, he revealed that they had been ordered to destroy oil facilities in the enclave. When FAPLA forces mounted an offensive against UNITA to retake Mavinga, Savimbi’s base, they were halted 20km from their target by UNITA forces, which were reinforced by the South African Buffalo Battalion. The FAPLA troops were forced to retreat to Cuito Cuanavale, situated 200km south-east of Menongue, at the limit of the Cuban line. The Soviets had advised the Angolans to launch an offensive against Savimbi in Mavinga, and they provided modern arms to FAPLA to crush UNITA. In July 1987, as part of Operation Saluting October, FAPLA troops began marching to Mavinga. After some successes against UNITA, the South Africans launched a counter-offensive, Operation Moduler, using a contingent of 9,000 troops. The village of Cuito Cuanavale is situated west of the Cuito Cuanavale river, and three Angolan brigades were based in an arc to the east of the river, connected to the west by a bridge. Two Angolan brigades were based in the west behind the village. With the South Africans in an increasingly threatening position, new Angolan President Jose Eduardo dos Santos asked the Cubans for further reinforcements to complete the operation and avert defeat. Cuba responded by sending tens of thousands of troops to help the Angolans, at the risk of Cuba being destabilised by the Americans. The Cuban reinforcements carrying materiel set out on 23 November 1987, and established the Southern Front General Staff, with General Leopoldo Cintra Frias in command. An advance party of Cuban advisers and technical staff moved to Cuito Cuanavale, which was under attack from South African and UNITA forces. On 13 January, the South Africans launched a massive attack on the east side of the Cuito Cuanavale river. The next day, the Cubans decided to move a tactical group from Menongue to Cuito. The South African attack on 13 January, a rainy day, was launched with the expectation that the Angolans would be unable to use their MiG fighter planes to help the ground troops. However, the weather cleared, and the MiGs were used to attack South African positions, using 32 tons of bombs in 22 missions. The South Africans retreated, leaving behind seven Olifant tanks and various other armoured vehicles. On 14 January, three South African and six UNITA battalions launched another fierce attack, breaking through a gap between the 21st and 59th Angolan Brigades. They moved to surround the 59th Brigade, as a prelude to surrounding all three brigades in the east, and securing the bridge to the west. A small unit of Cubans, with seven tanks, managed to stop their advance, and the South Africans failed to take the bridge. The Cubans lost 14 men and six tanks, but the three Angolan brigades were able to retreat out of harm’s way. The South Africans again came under MiG air attacks on 16 January, suffering heavy losses. On 20 January, they destroyed the bridge using unmanned aircraft, and mounted a massive attack using Olifant tanks, and Eland, Ratel and Casspir armoured cars. The Cuban/Angolan forces, using Shilka cannons and Strela missiles, shot down a South African Mirage F1 aircraft carrying Major Edward R Every. Commander Frias moved all the Cuban/Angolan forces west of the river, leaving one brigade in the east, with the planes continuing to bombard the South Africans. The South Africans, increasingly outmanoeuvred, launched an attack on 25 January, which was repelled. Their last attacks took place weeks later, on three days: 1, 21 and 23 March. On the first of these, they lost 20 men, and 59 were injured. In the last attack, they retreated in haste after suffering heavy losses, leaving behind various military vehicles, including three Olifant tanks. Still, they continued to mount attacks even as they retreated, and the MiGs were ordered to take out the South Africans’ G5 and G6 cannons. One G5 was destroyed in the Chambinga River. Meanwhile, the Cuban-Angolan forces, together with SWAPO combatants, began an offensive towards the Namibian border. With 40,000 Cubans, 30,000 Angolans and 1,000 Namibians, using 1000 tanks, 1,600 anti-aircraft weapons and artillery, as well as 1,000 armoured vehicles, they moved south, engaging in the first skirmish on 4 May, when they ambushed a battalion of the South West Africa Territorial Force (SWATF), inflicting 30 casualties. Further clashes took place between 20 and 26 June, with two Cubans losing their lives. On 27 June SADF forces were again ambushed, with 20 men from the 32nd Buffalo Battalion killed. The Cuban/Angolans began to turn Cahama airstrip into an operational base. Bulldozers and loading equipment were sent from Cuba, and by June the airstrip was reconstructed – 2500m long and 30m wide – so that large aircraft could land there. Another 2600m airstrip was completed soon after the first. By June the Cuban Angolans were 50km from the Namibian border, and the South Africans were forced to the negotiating table. Various meetings took place to bring an end to the hostilities, the first in July 1987, between Angola and the US, just as the attack on Cuito was beginning. Another took place on 7th and 8th September, with no positive result. At a third meeting on 28th and 29th January 1988, the Angolans and Cubans (represented by Jorge Risquet) demanded that the US end its support for UNITA. From 9th to 11th March 1988, and 17th to 18th March, tripartite talks took place in Luanda. The Cubans proposed that the US and South Africa observe UN resolution 435, in return for which Cuban troops would withdraw to the north of the 13th Parallel. The first quadripartite talks took place from 3rd to 4th of May: Angola, Cuba and on the other side South Africa, with the US as ‘mediator’. These were continued in Cairo on 24th and 25th June, at which the South Africans proved obstructive to any agreement. A third round of quadripartite talks took place in New York on 11 July. South Africa finally withdrew from Angola in August 1988, and the final accord was signed on 22 December at the UN in New York, opening the way for UN Resolutions 435/78 to be implemented. After SWAPO won the first election in Namibia on 21 March 1991, the last Cuban troops returned home on 25 March 1991. While Cuba was the central actor in defending Angola from South African military aggression, the tiny island nation also provided other forms of support in the struggle against apartheid: diplomatic, economic, ideological, moral and psychological. From 1959, when the Cuban revolution brought Fidel Castro’s Communist Party to power, the Cubans supported the anti-apartheid movement in diplomatic interventions at the Non-Aligned Movement (NAM), UN and other forums. In 1977, Cubans began training African National Congress (ANC) cadres at Nova Catengue in Angola, instructing them in guerrilla warfare. After the camp was bombed by the South African Air Force, the camp was moved to the Quibaxe area of Kwanza Norte province, where ANC cadres were trained to infiltrate South Africa. Joe Modise, the head of uMkhonto we Sizwe (MK), the ANC’s military wing, requested the assistance of the Cubans at meetings in Lusaka and Harare in 1987. These relations were maintained throughout the 1980s. In May 1990 Chris Hani, chief of the General Staff of MK, asked the Cubans to help train officers for the post-apartheid army. The South African Communist Party (SACP) had established relations with the Cubans from the 1970s. SACP chief Joe Slovo held increasingly frequent meetings with the Cubans from 1986 onwards. On 10 June 1986, he met with Jorge Risquet, where the pair analysed the internal situation in South Africa. At Slovo’s request, the SACP’s Seventh Congress was held in Cuba from 7th to 12th April 1989. Also in 1989, Slovo attended a meeting at the Cuban embassy in Lusaka, Zambia, requesting arms and ammunition, among other things. In response to all these requests, Cuba delivered arms to MK throughout the period from 1987 to 1989. The ANC established a diplomatic office in Havana in December 1978, and in 1994 it became the official South African embassy in Cuba. 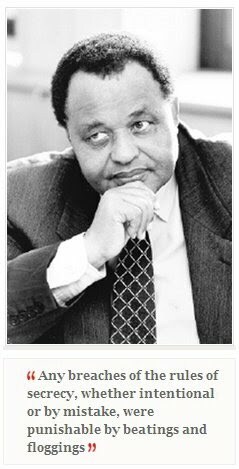 Headed by Alex la Guma, the office was extremely active throughout the anti-apartheid period. The Cubans also established schools for South African and other African youth, with the first African students arriving in 1977. By 1988, some 16,000 students were educated at the Isle of Youth – as the school became known. Oliver Tambo visited the school in March 1986. Later, plans to develop a special school for South Africans failed to materialise – despite a firm commitment by the Cubans to realise the project – because the South African youth preferred to prosecute the armed struggle. Cuba participated in important anti-apartheid conferences, notably a conference on sanctions held in Paris from 20th to 27th May 1981, and another from 16th to 20th June 1981, also held in Paris, called the International Conference on Sanctions Against South Africa. When the Cubans awarded one of their highest honours, the Order of Playa Giron, to Nelson Mandela in 1984, Alfred Nzo went to Havana to accept the award on Mandela’s behalf. Oliver Tambo was given the same award in March 1986, and was accompanied by Thabo Mbeki and Gertrude Shope when he went to receive the award. The trio held talks with Cuban leaders to find ways to make the country’s aid to the ANC more effective. In September 1987, a tripartite meeting took place in Moscow, with South Africa represented by Oliver Tambo, Cuba by Jorge Risquet, and the Soviets by Anatoli Dobrynin. Joe Slovo, who also accompanied the South African delegation, later held talks with Risquet, and revealed that he had disagreed with some Soviet academics’ perceptions of the state of the anti-apartheid struggle. On 7 January 1987, the Cubans established the Cuban Anti-Apartheid Committee (CAAC), to coincide with the 75th anniversary of the ANC. Although the Cubans had played a larger part in the general anti-apartheid movement, and had kept many aspects of its involvement from the eyes of the international community, the country’s leaders decided that the time had come to broaden their support with the establishment of the CAAC. One of its first initiatives was to propose that the University of Havana grant Nelson Mandela an honorary doctorate. • Hedelberto Lopez Blanch, &lsquo;Cuba: The Little Giant Against Apartheid&rsquo;, in The Road to Democracy in South Africa, Volume 3, International Solidarity, Part 2. Published by South African Democracy Education Trust, Unisa Press, 2008.